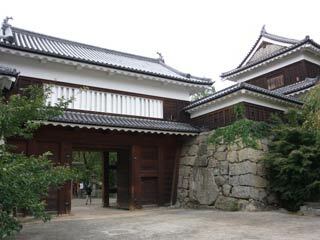 Ueda Castle (上田城) was built in 1583 by Sanada Masayuki. It is flatland castle located in Ueda, Nagano. It is considered one of the strongest castle because Tokugawa Ieyasu attacked this castle twice in 1585 and 1600, but Sanada Masayuki and his son Yukimura defeated Ieyasu''s both time with small number of samurai and Ueda Castle. Today, it is popular Sakura spots and there is a shirne enshrines Sanada clan. Ueda Castle was built by Sanada Masayuki who is one of the most famous Samurai in Sengoku Period. He was served for Takeda Shingen and Katsuyori. After the fall of Takeda clan, Masayuki became independent Daimyo and built this castle. In 1585 and 1600, Tokugawa Ieyasu attacked this castle, but Masayuki and his son Yukimura fought well and protected this castle. However, after the great battle of Sekigahara, Ueda Castle was destroyed completely. Current ruins of Ueda Castle was built in 1626 by Sengoku Tadamasa. ... is located in Honmaru. This shrine is dedicated to all the past feudal lords of Ueda Castle - Sanada clan, Sengoku clan and Matsudaira clan. Sanada Masayuki and his sons built Ueda Castle and made this castle town in 1583 during the Sengoku period. The lords of Sengoku and Matsudaira did an exceptional job of administering the Ueda clan and maintaining peace and order of society. Sanada Yukimura, in particular, is reputed to be the most resourceful samurai in Japan for twice defeating Tokugawa forces that were more than tem times the size of his troops, and so his soul is worshipped as a God of wisdom. ... was also secret pass. ... is remaining since 1626. It is built by Sengoku clan. Because this place gets lots of snow in winter, it takes the same construction of northern Japan buildings, and walls are painted plaster for fire proof. It is registered as a historic asset of Nagano Prefecture.